* Note: Soak the mussels in cold water for 20 minutes, then rinse thoroughly to remove any sand. Pull off any "beards" and throw out any mussels that are cracked or open. Cook the chorizo in a pot that's large enough to hold the mussels. Remove the cooked sausage and all but 4 tablespoons of the fat left behind. Add the shallots and garlic and cook until softened about 3 minutes. Add the cooked chorizo, the beer, and the mussels. Close the lid and steam the mussels until they open, about 5 minutes. 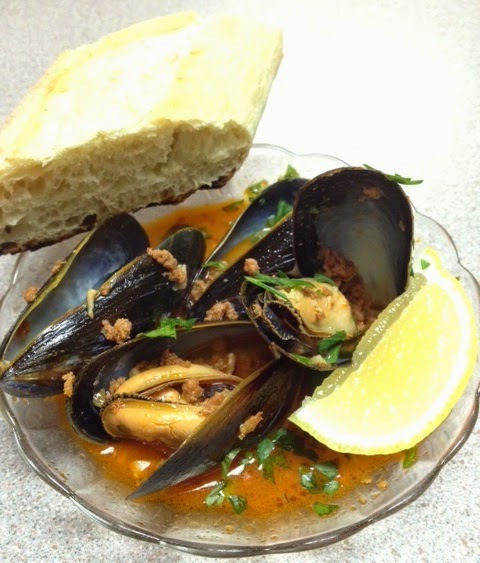 Once they are open, turn off heat and ladle the mussels/sausage/broth into serving bowls. Squeeze a lemon wedge over the mussels, sprinkle with the parsley, and top off with a few turns of black pepper.